I recently started a business to offer aerial photography services in Toronto and central Ontario region. It’s been a long time coming, as I’ve been playing with multicopters for a couple years now, and people always ask me about taking photos/videos for them. Sadly due to Transport Canada regulations, it’s a bit of an ordeal to make the move from hobby use to paid use. So to that end, I have created Fresh Perspectives Aerial Imaging Inc., a federally registered and insured company through which I may offer aerial photography services. 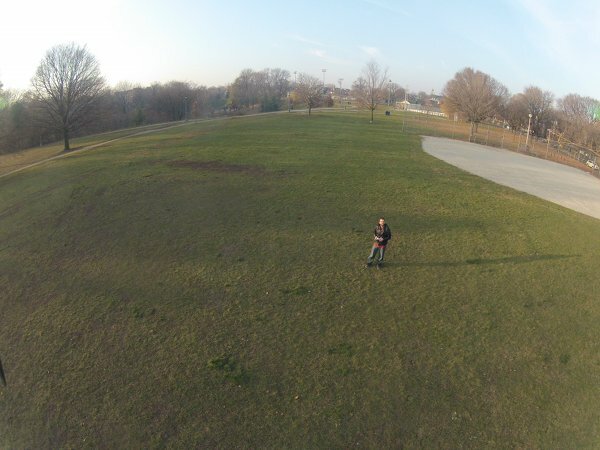 I’m still working on getting it set up, but the page has some sample aerial shots. I’ve already received flight permission from Transport Canada, so new missions should be pretty straight-forward. Feel free to contact me about any mission ideas. Just though I’d make a quick post about the inexpensive scope I picked up last year before I started working on multicopters. Sadly I don’t have any new information to add, but I’ll summarize my findings and provide some (hopefully) useful links below. I was searching for a small digital scope for general purpose use so I wouldn’t have to keep hauling around and firing up my Tek 585A. I wasn’t real picky on specs, so long as it was comfortable up to a few MHz, and had support for USB interface with a PC. Long story short, I ended up with an Atten ADS 1102CAL, which shares its hardware with the Siglent SDS 1102CNL. This is good news, since Siglent is a slightly more reputable company, and they also release firmware updates for their scopes (more on that later). For a detailed review on the scope, check here (CML version with more memory) or here (siglent version). There’s also a hardware teardown posted here. There are lots of pages online complaining about bugs in this scope, but most of them are on older firmware. Sadly, atten doesn’t offer firmware updates, and the only way to get the newest firmware for this hardware seems to be to install the Siglent firmware. Details here. I haven’t done this yet, but I’ll update this post after I try it. For linux users, I also found a program called attenload which allows user to pull screenshots and data from the scope similar to the windows software that atten provided. SSH with no password*, no username, and SSH host aliases. Want to increase convenience at the potential expense of security? Don’t we all. Well here’s how to authenticate without passwords*, and make aliases for your hosts while you’re at it. First of all let me get that * out of the way. While it is possible to set up ssh logins with no password at all using this method, I recommend using a password when creating your key pair. This will give one master password shared between all logins that only needs to be entered once per session. First of all you need to create a public/private key pair. I’ll assume you haven’t already done this. And set the file permissions, if the file didn’t already exist. Once this is all set up, you should be able to ssh mybox, and the system will automatically select user name ‘myname’ and use the DSA key pair instead of a password. A C370 with a defective protection circuit generally fails in a specific way. The amp will work fine when cold, but after being on for several minutes, the protection circuit will activate. Power cycling will not help, unless the amp is allowed to cool fully before the next attempt. Well if you found me by the google because precisely this happened to you, you’re in luck. I just repaired mine for the wonderful sum of 63 cents. To perform this fix you need to be somewhat comfortable with a soldering iron, and be willing to take your amp apart. If you aren’t very good with an iron, you’ll want to read through some how-to pages elsewhere until you’re comfortable with replacing through-hole capacitors on a printed circuit board. My C370 ripped apart on my workbenchSo it turns out the design issue with these amps is that NAD decided to put a hot-running diode right beside (touching!) some electrolytic capacitors in the protection circuit. The heat from the diode ages the capacitors prematurely, which causes their values to drift. The new values tend to cause the circuit to activate unnecessarily. The protection circuitLuckily, the fix is simple. First of all, locate the protection circuit pictured above. As you can see from the picture, mine had some obvious heat problems. Nothing looks broken per se, but it looks nicely toasted, especially on the right side and top. To get it working again, I’d recommend replacing the three topmost capacitors. Their values are 4.7uF, 47uF and 10uF all rated at 50V. I wouldn’t get anything larger than 50V as I’m not sure if it would fit. NAD C370 Protection Circuit SchematicWith those three caps replaced, the amp should work fine. But in a couple years, those caps will die too. I found a great solution on a forum: move the diode to the other side of the board. Warning: make sure you keep the proper orientation of the diode when putting it on the other side of the board. Diode on the back of the boardNow apply power, hope there aren’t any sparks, and enjoy the music! 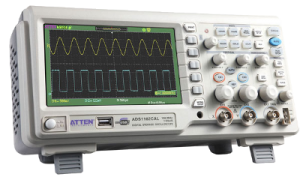 Thanks to my local freecycle list, I just got myself a new oscilloscope. The Tektronix 585A, from what I’ve read, represents the peak of tube oscilloscope technology. 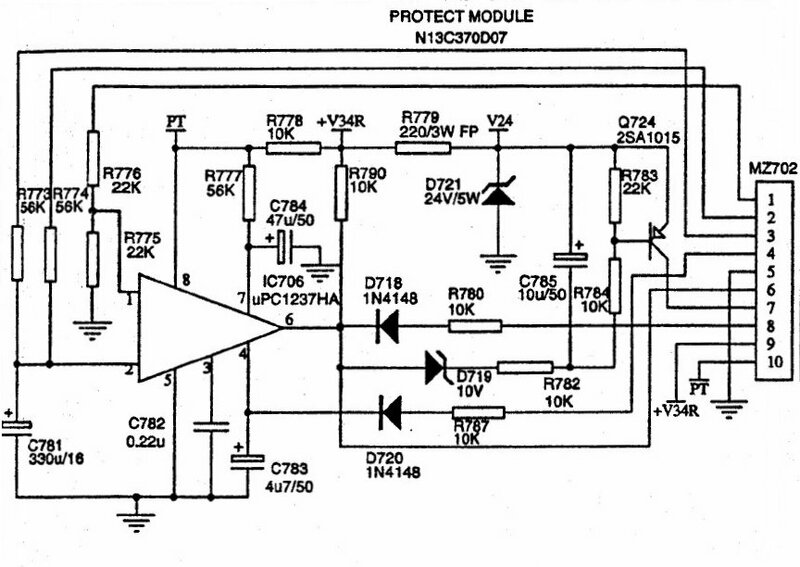 It was originally designed to be a 100Mhz scope, but the plugins never realized this figure. The plugins are interchangeable units that provide vertical amplifiers and all the necessary controls for one to four channels. You can quickly swap between them to change the sensitivity/rise time/etc of the scope. You can see 2 extra plugins on the cart beneath the scope.Surprisingly enough, this 37 year old behemoth fired right up, and has given me little trouble so far. It seems to be more or less calibrated, and has only some minor dust in the controls. This unit came with four plugins, the cart and a camera attachment, which I’ll detail later, as well as full instruction manuals for everything. Tektronix makes wonderful manuals that not only cover operation, but troubleshooting, repair, calibration, and full schematics for everything. I’m confident there is enough information in the manuals for me to keep it running indefinitely. If anyone wants more information on the scope, or details from the manuals or anything like that, feel free to contact me. In my googling I’ve noticed that people are still using and repairing these, but many are short on manuals and such. I’ll post more details on the set-up later. edit: I didn’t post those details. Feel free to contact me if you want some info. I’ve recently wanted to rip some CDs to several different formats at once. Say a FLAC copy for the computer, and an mp3 for the portible. After some searching, Abcde (A Better CD Encoder) seems to be the best package on linux for this. It is based around a bash script that will do CDDB lookups, and then use cdparanoia to rip the files, and encode them in your chosen formats. To set mp3 encoding at alt-preset-extreme, and ogg encoding at Q6. I have also edited a little bash script I found. It’s available here. When run, it will make .m3u files for all mp3s in the current directory and all subdirectories. Just put it in your path.